France expects terror suspect extradition Jump to media player The French government says it expects that the Paris attacks suspect, Salah Abdeslam, will be extradited to France within days. Paris suspect arrested in Brussels Jump to media player Paris attacks suspect Salah Abdeslam has been wounded and arrested in a raid in Brussels, officials have said. 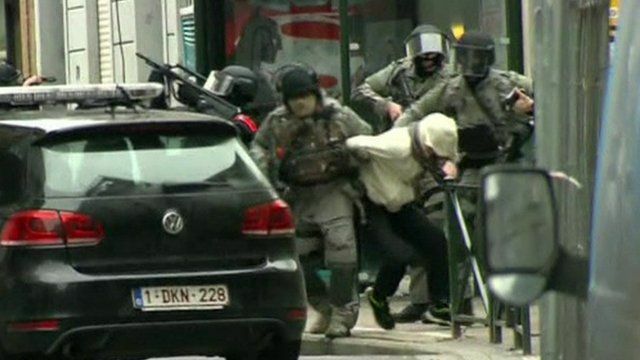 Police arrest Paris attacks suspect Jump to media player Footage has emerged of Paris attacks suspect Salah Abdeslam being arrested in a raid in Brussels. Explosion heard during live news report Jump to media player An explosion was heard when Damian Grammaticas was reporting from the scene at Molenbeek. The French government says it expects that the Paris attacks suspect, Salah Abdeslam, will be extradited to France within days. Mr Abdeslam was arrested in Brussels, after being shot in the leg by police.